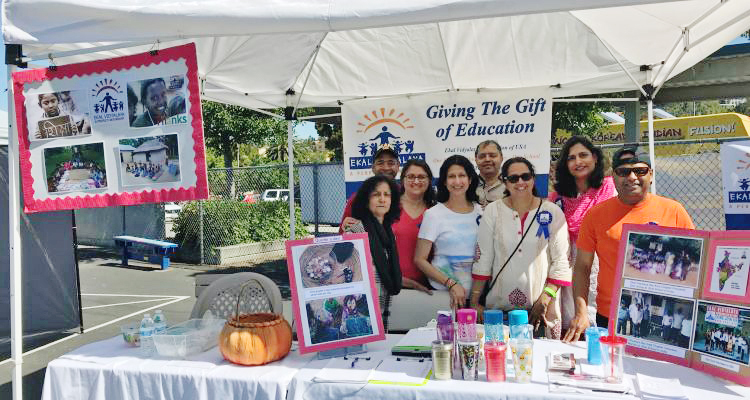 Ekal Silicon Valley Bay Area Chapter participated in International fair at Wiebel Elementary School in Fremont. 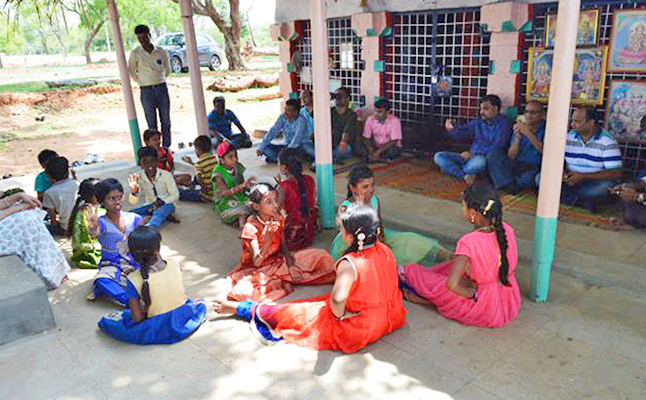 Ekal's “Quarter a day’’ program attracted 20 kids. One more program was also arranged by Gurukul based on the success of this school program. 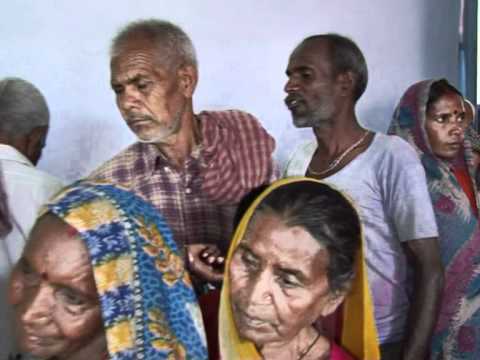 Former Ekal Aacharya, Vinod Kumar a native of Sant Ravidas Nagar, Bhadohi, desired strongly to do something towards the country when he served the villagers and children of their village through Ekal Abhiyan. 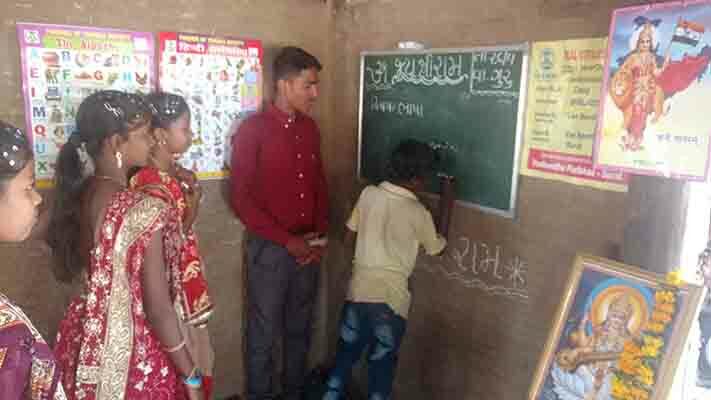 Motivated by Ekal Abhiyan and with the blessings of his parents and elderly people, he prepared for the army while teaching in Ekal Vidyalaya of his village. 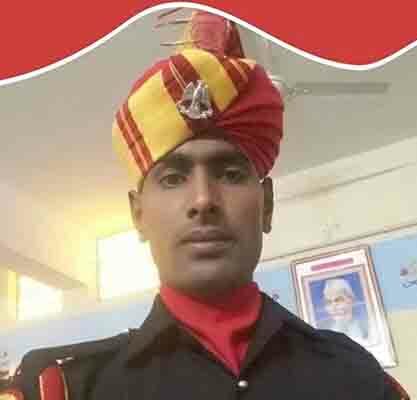 He got selected in Army and is feeling proud of serving and protecting the nation. Today, Vinod acknowledges Ekal Abhiyan for his success. The Ekal Aacharya becomes the Guardian of Mother India. The picture shown is an upcoming Geeta Devi Poddar national training centre at Karanjo is being supported by Shri Ajay Poddar, son in law of Shri Vinod Jhunjhunwala. Awesome generosity shown by Shri Ajay Poddar. 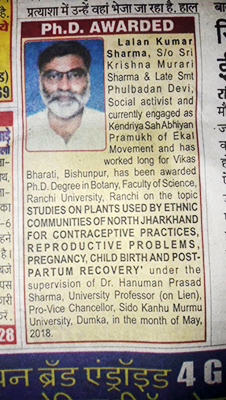 Our ‘Sah- Abhiyan-Pramukh’ Sri Lalan Kumar Sharma, who leads the field work at Ekal India, has been awarded Ph.D. in Botany from Ranchi University. The topic of his thesis was "Studies on plants by ethnic communities of North Jharkhand for contraceptive practices, reproductive problems, pregnancy and child birth and post-partum recovery". 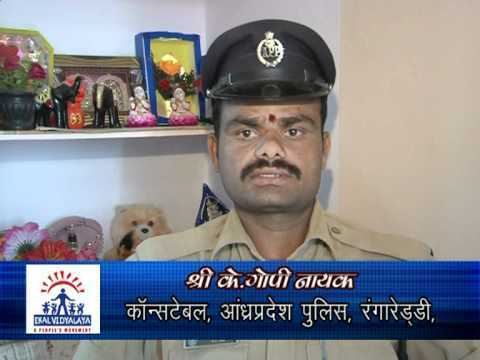 We congratulate Sri Lalan Kumar Sharma on this great accomplishment. On 12th June 2018, a seven day training of 15 Arogya Sanyojika/ Sanyojak was inaugurated by Director in chief, Health Services, Govt. of Jharkhand. The training was innovative as it was to train them with 3 new schemes of Arogya Prakalp. The Director promised to help us in telemedicine project and appealed to create awareness about Government Health Schemes. 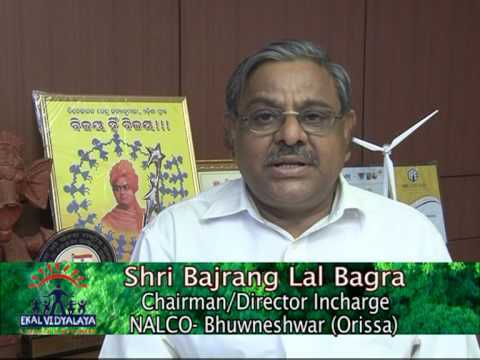 Shri Bajrang Bagra took responsiblity with Ekal movement on June 28, 2013. He has completed 5 very productive years last month. 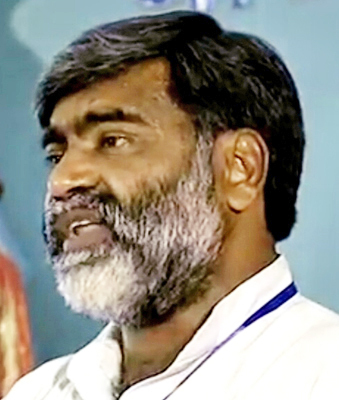 During his period so far, Ekal has grown from 54000 villages to 74000 villages! He shares his experience while thanking those Ekalities who have educated, inspired and supported him. "On completion of 5 years in Ekal today, a review of new phase of life is naturally called for. In summary, I consider these 5 years as a successful initiation of my Vanaprastha phase of life. Many challenges came in the way and all of them got resolved, some in full and remaining partially. The Organization is facing great challenges ahead of it, for the emphasis now is on impact besides numbers. The first year was invested in familiarising with volunteers from cities and hinterland, in understanding organizational structure, history, plans, methods, internal relationship of various institutions, etc., in addition to visiting field from forests to villages to absorb the nuances of field work. After some time, the charge of President of Central Executive Committee brought responsibility of decision making and also to oversee overseas chapters. While the robust structure of the organization made the working and decisions fairly easy and smooth, the rapid expansion over the last decade has posed new issues. The rapid growth precipitated challenges and the decisions to meet them were not easy, nor swift due to slight centralisation of decision process. The genuineness of activities of the organisation was perceived at stake at times. These challenges were successfully met with courage, patience and able guidance of leadership. A clear and strong message has gone around in relation to discipline and transparency. This opportunity to work with dedicated Ekal volunteers from cities and villages has hiked my confidence in bright future of Bharat. These volunteers are the real and invaluable asset of the organization, in India and abroad too. Despite the clarity and importance of the goal, if the volunteers lack dedication and capability, no social work can be successful or sustained. It is of critical importance to preserve and promote this capital asset. 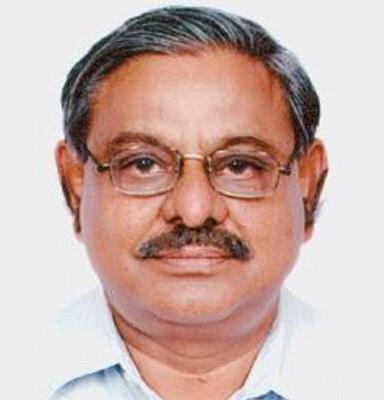 Ekal is bestowed with several devoted volunteers whose dedication and sacrifice are unique and exemplary. My own contribution is too little, since many volunteers have given life to Ekal, whereas I could gather courage very late in the life. To name a few such volunteers would be injustice to the rest. All of them have been constant source of inspiration for me, continues so. My heart is filled with contentment and happiness when I look back and take stock of this period. The possibilities bear no limit, but any analysis has to be made in context of contemporary society only. I have full satisfaction on whatever Ekal could accomplish in the prevailing circumstances. The thrill of working in new environment and with new companions, alien echo system of working with volunteers only, the challenges, struggles and attaining the goals, some in full others in part, are my valuable earnings over these five years. Initiation into Vanaprastha phase of life could not have been better than this. I express my sincere obligations to Ekal leadership to have provided the opportunity. The challenges, to enhance the relevance of Ekal in the changing era of Indian society by generating the required energy, innovative experiments, maintaining transparency and all put together leading to better impact, will undoubtedly keep all the Ekal activists alert, enlightened and motivated." Ekal Vidyalaya movement, does the inspiring work of providing children, literacy as well as culture/tradition education successfully throughout the country, including remote areas of the Northeast. Children graduating from Ekal Vidyalaya schools are turning out to be productive citizens. These children can be expected to be vehicles of propagation of their culture in the future. The journey associated with Ekal Vidyalaya Movement is marching ahead rapidly in the Northeastern region of Bharat. The Ekal movement has reached Assam, Tripura, Manipur and Arunachal Pradesh. The number of schools is envisioned to increase to 30 in Batdrava (Assam) in the foreseeable future. 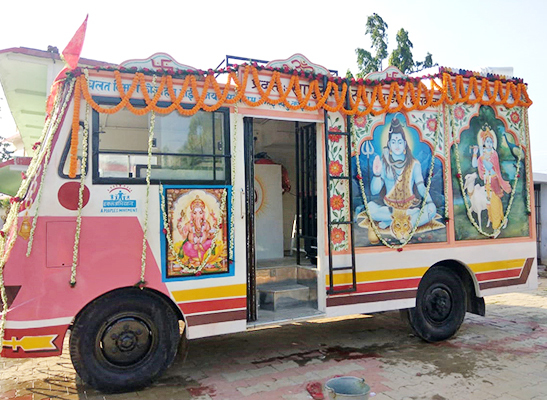 For this effort, there has been incomparable cooperation from Matru Mandir. 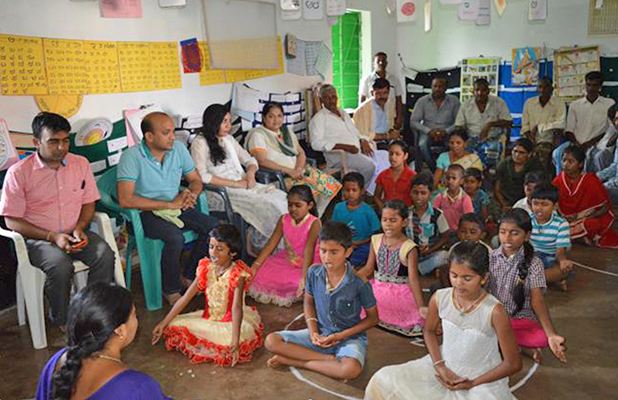 This cooperation is invaluable because the Ekal Movement is developing “human capital” through the medium of education provided to small children in small villages in remote locations. 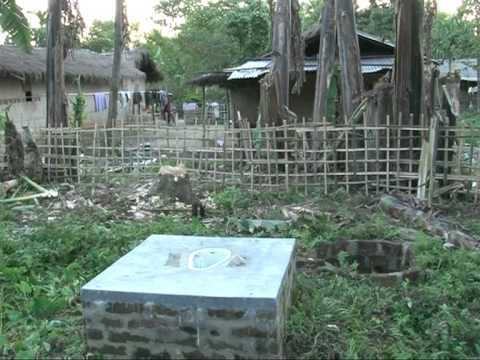 The “vanvasi” communities (tribal areas) are being awakened through Ekal Movement’s efforts. 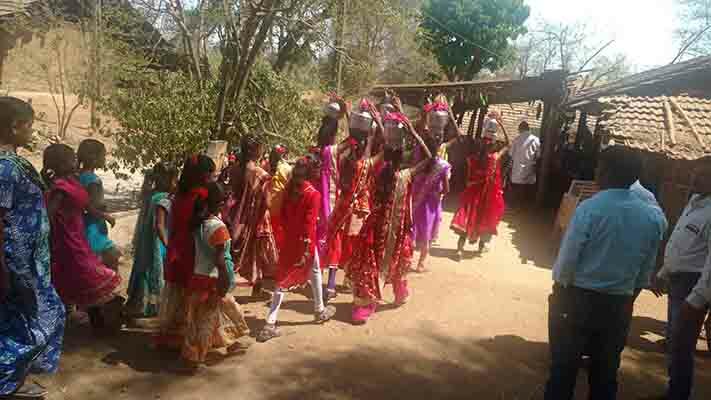 Ekal Movement is not just limited to literacy; this Movement is ensuring the progress and security of the villages. At the current time there are 5,580 schools operating in the Northeast. The efforts towards reaching goal of 9,000 schools by 2019 have been initiated. It is certain that Ekal Movement is strengthening the spirit of Indian-ness. Under this Movement, several tribes are being united and brought to one common platform. Mass scale interactions between spiritual leaders of several tribes are taking place. Despite the diverse nature of their beliefs, efforts are on to develop a cultural and spiritual relation between these diverse tribes. 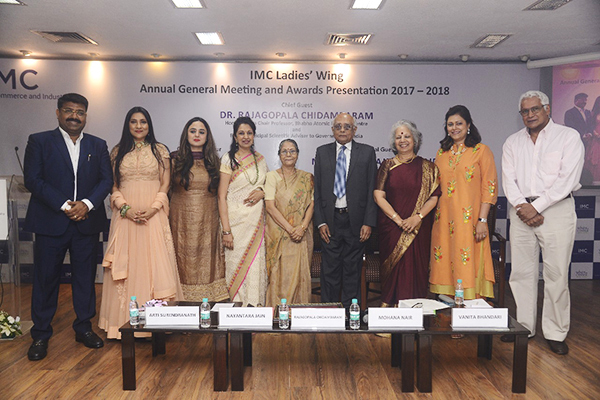 Indian Merchant Chamber (IMC) of commerce and industry, ladies wing bestowed honours on Manju Srivastava, National President Ekal Sansthan and Trustee of Ekal Movement, as Special Awardee for Winds Of Change, in their AGM on 12 June 2018. 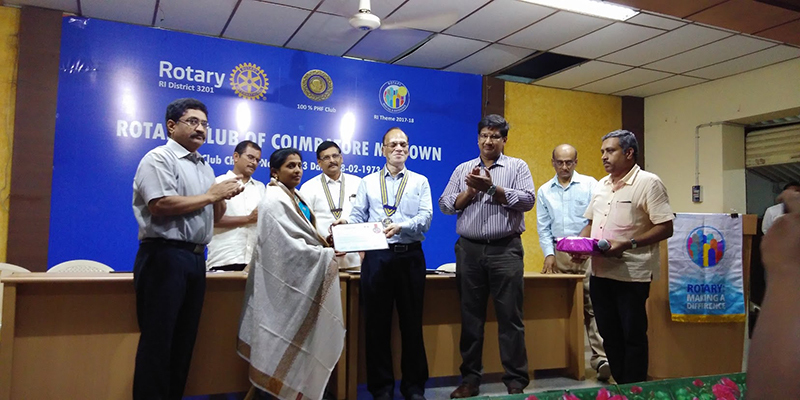 Dr. Rajgopala Chidambaram of Bhabha atomic energy institute was the chief guest. 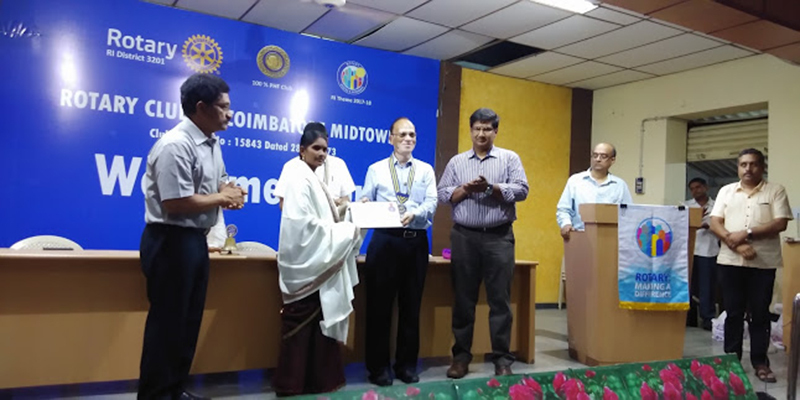 The Rotary Club Coimbatore Midtown recognizes unsung heroes & heroines under 5 categories - Education, Health, Culture, Sports and Service to Humankind. For the last 10 years, they are honoring the awardees with a citation and a small gift. They generally select new personalities every year and this year they had chosen 2 Ekal fulltimers in the area of Education for felicitation. Smt. P Jayanthi who is a native of Pe.Thaathampatty village in Harur Taluk in Dharmapuri district, has served as Sanch Prathmik Shiksha Pramukh, Harur and is presently Anchal Abhiyan Pramukh. Smt. M Archana who is a native of Nambipatti has served as Sanch Prathmik Shiksha Pramukh, Harur and is presently Anchal Prathmik Shiksha Pramukh Pramukh. During their tenure in Sanch, these two dedicated women have ensured regular visits to the villages. 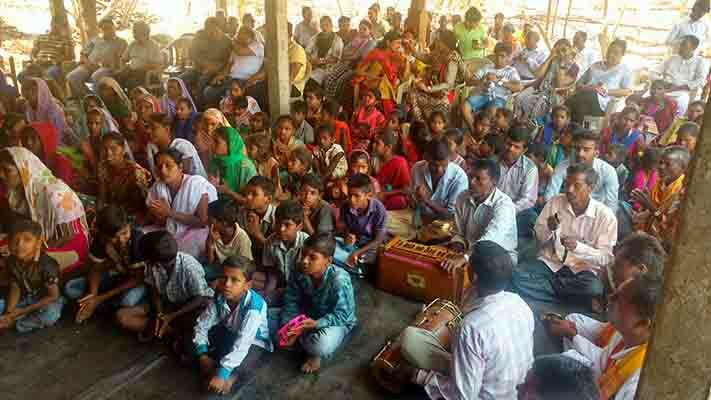 They have motivated the village organizers in attending the monthly training program where syllabus, study materials, patriotic songs for the following month and any message/directives received from the centre were imparted. 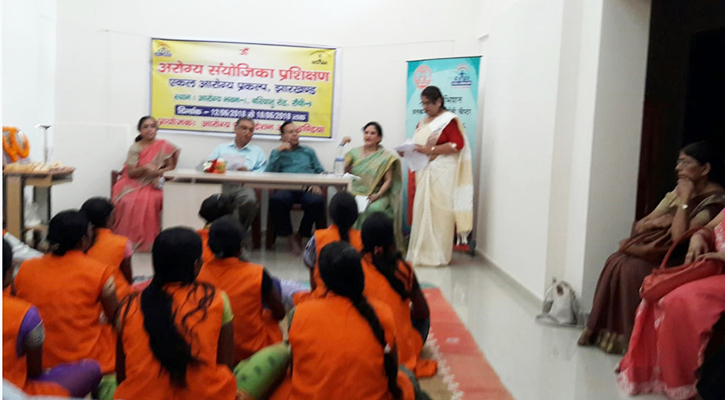 They also have undergone training in Health Awareness Program of Ekal (Arogya Yojana) – Home Remedies for Anaemia and Malnutrition and educating healthier food and lifestyle. 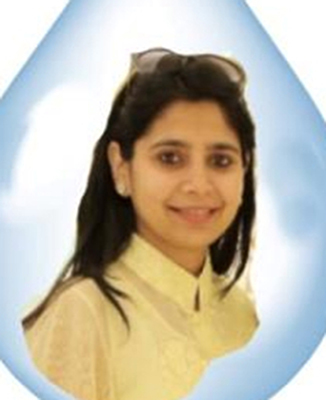 Neha Mittal, a renowned social entrepreneur in Indore, is a social worker since childhood. Neha Mittal had intense passion for serving the community and work of the welfare of the underprivileged particularly women and children from urban and tribal localities. She started her first vanyatra when she was in her 8th standard and there she started a journey that created legendary milestones in various tributaries of serving people. Ekal welcomes its new leader of Youth army Ms. Neha Mittal. There is a Parivartan Kumbh planned on 17th to 19th November 2019, where a grand youth team should be formed who could assure all the stakeholders to be confident of future of Ekal. 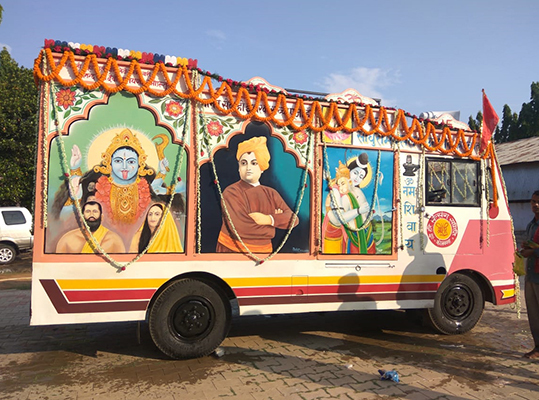 On 21st June 2018, the Governor of Jharkhand inaugurated the 32nd Rath which was donated by Shri Sajan Bansal. 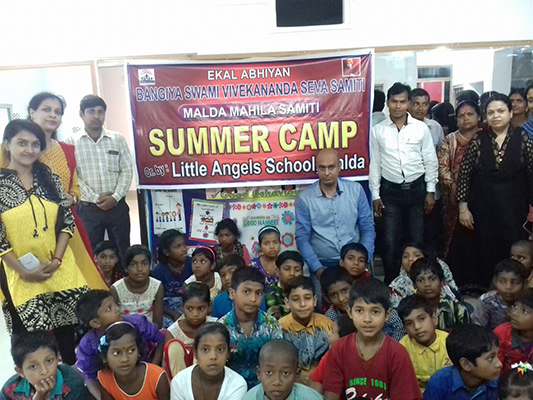 A summer camp with Little Angels School, Malda was organized by Malda Anchal Mahila Samiti. The camp was much appreciated by parents and teachers and specially children who enjoyed every bit with fun and enthusiasm. 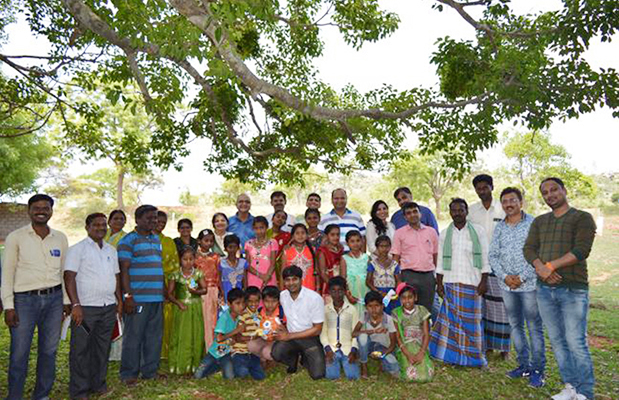 President Sri S Muralidharan, Treasurers Sri P Rajesh and Sri G Krishnamurthy of Ekal Educational & Charitable society visited Madhamkunnu and Karimathuvayal Ekal villages in Wyanad district. 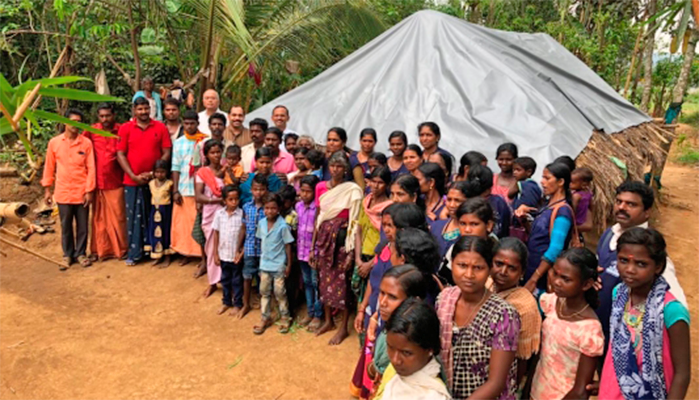 Sri Muralidharan handed over the rexine sheet to cover the housetop of Smt Seetha. 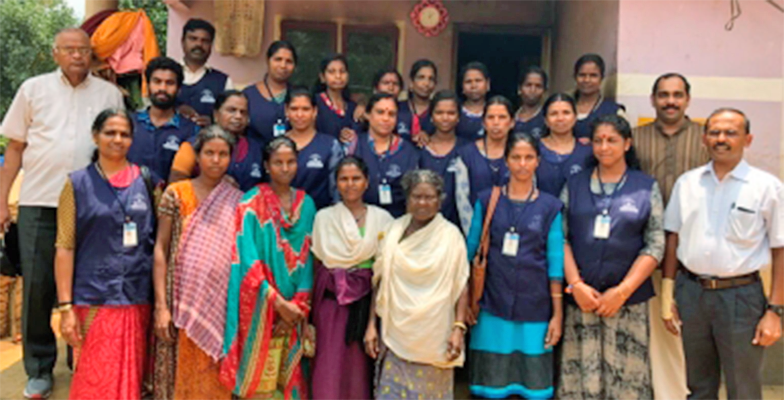 EECS is trying to provide covering sheets to all the 32 houses in the colony, the team also took part in the training camp of Ekal full timers and sanch samithi meeting in Meppadi. On 26th and 27th April, 2018, FTS Surat chapter conducted a vanyatra program in Dang Anchal. Sri Bansal, Sri Shyam Garg, Sri Suresh Agrawal, Smt Viyaya kokada along with 20 other members were present. 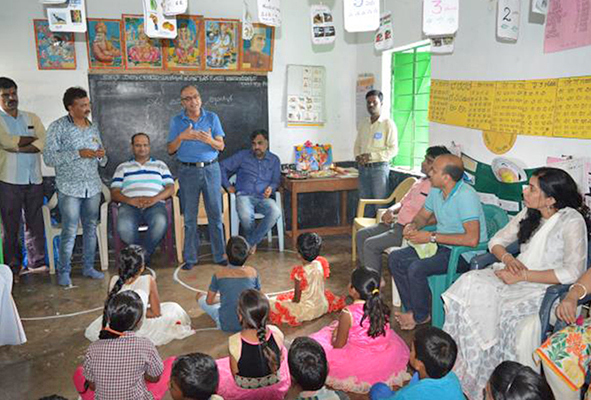 The team visited 2 Ekal Vidyalayas in Vanarchod and Chikar village. The children welcomed the visitors with flowers. They had an interactive session with the children and they sang some patriotic songs. Katha, bhajan, keerthan were organized by Sanskar Siksha and Satsang Mandal. 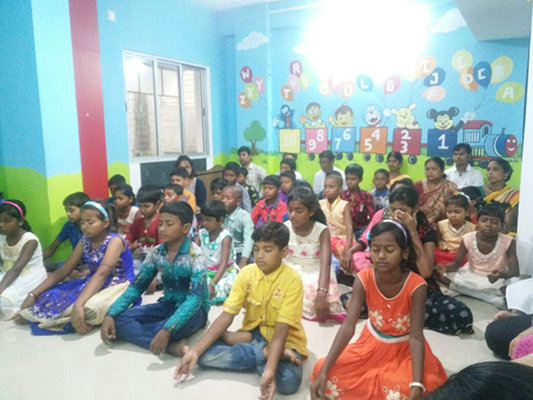 Master Druv, a student who had visited compared the Ekal school with his and felt that the children here knew a lot more and said it was a learning experience. Vanyatra is an important tool for propagating the cause of Ekal. It provides an insight to the donors - both existing and prospective – regarding the actual working of Ekal System at the ground level. With this in view, the two FTS Chapters in Bengaluru organize regular vanyatras at monthly intervals. The latest such vanyatra was conducted on the 13th May, 2018. The village visited was Melajipura and Marallipura in Harave Sanch.